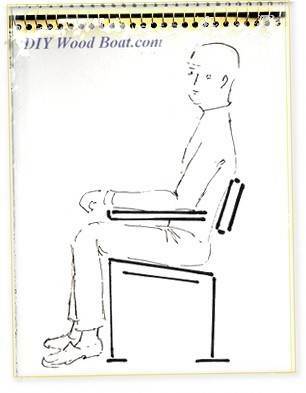 Ergonomics of wooden boat design. The term Ergonomics is not a recognisably nautical one. 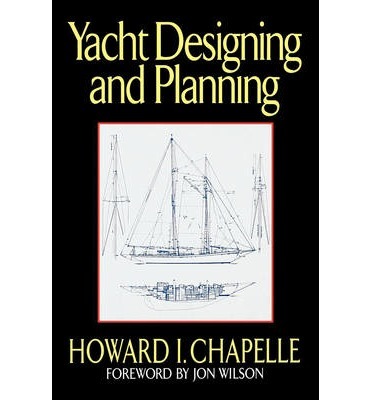 However, the principles are an important ingredient in boat design. Furniture designers put a lot of effort into optimising the dimensions of a dining chair for the home. On an unstable platform, such as a boat it is even more important to design furnishings that are not only comfortable but functional. The furniture makers designing for the mass market have developed a set of average dimensions so their furniture will suit the average person. These are a good starting point for anyone fitting out a boat. However, like most things on a boat there will have to be compromises. Seat depth from the front edge to the back; 13-15inch, 340-375mm. Seat height at the front edge; 15-17inch, 390-430mm. The backrest should support the middle of the back; 6-7inch, 150-180mm above the seat. Arm rests want to be 8-10inch, 200-250mm above the seat. It will help stop the user slipping off the seat if, it slopes down towards the back by at least 10 degrees. The helmsman’s seat should be high enough to allow him/her to comfortably see over the cabin. The cockpit seating particularly on a sailing boat should allow for the occupants to brace their feet. If the foot well tapers from 24inch, 610mm forward to 18inch, 460mm aft this should allow most leg lengths to brace their feet against the leeward seat. Cockpit coamings are there primarily to keep water from the side decks draining into the cockpit. However a slope of 20-25 degrees on the inside will increase the comfort for those sitting in the cockpit. To allow for ease of access the minimum size of hatches needs to be 18inch, 460mm square, but preferably 24inch, 610mm. Sliding hatches should be at least 24inch, 610mm square. The head of the berth should be at least 22inch, 560mm. The foot end can be a narrow as 15inch, 380mm. The average ergonomic length of a berth wants to be about 6ft 3inch, 1905mm. Or three to four inches, 100mm longer than the height of the sleeper. For use at sea bunks need to be narrow with lee cloths or boards. The sleeper must be able to wedge themselves in. There are numerous ingenious ways of building a bunk so that it can be converted from a narrow sea going single, to a spacious double for use at anchor. Sorry guys, but it will probably be best to sit this one out. Even if you do have standing head room in the heads, could you guarantee you aim in a moving boat? Even when sat, using the heads in a small boat at sea can be a difficult maneuver. The following dimensions are just guidelines. Head room above the seat 36inch, 900mm. Ergonomic elbow room 24-27inch, 600-700mm. For comfortable use the height to the top of the hob wants to be about 36inch, 900mm. Clearance above the hob at least 30inch, 750mm. If possible allow for a 3inch, 75mm kick space under at floor level. Ergonomic leg room height under a table needs to be about 24inch, 600mm. Knee clearance, horizontally, for comfort should be about 10inch, 250mm.